"When one of the best Sonic games wasn’t enough, SEGA give you more." Wanna go fast? Got a nerve that only SEGA’s poster child can itch? Well you’re in luck because today SEGA announced that Sonic Mania Plus, the definitive version of the critically acclaimed platformer Sonic Mania. Still want more? How about new characters, new zones, new modes, and some artwork? Well once again you’re in luck as Sonic Mania Plus introduces two new playable characters from past Sonic games, Mighty the Armadillo and Ray the Flying Squirrel and an Encore mode that will provide a fresh look to familiar zones with new challenges and layouts for new and veteran players alike. Competition and Time Attack modes will receive an update allowing four player competitions, and ghost challenges for time trials. This content packaged in an all-new physical edition which will come with a 32-page collector’s artbook, a reversible SEGA Mega Drive cover, and holographic packaging. 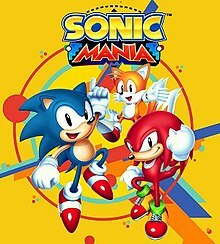 For all those who purchased the original digital version of Sonic Mania on consoles and PC, an Encore DLC pack will be available for sale at £3.99 or $4.99 via Steam and first party stores on July 17, 2018 to upgrade to Sonic Mania Plus. Therefore obviously Sonic Mania Plus will release on July 17, 2018 in North America and European markets. Fans can now pre-order the game digitally for Sony PlayStation 4, Xbox One, and Nintendo Switch from first party stores and at participating retailers.